Unique to Camp Cowabunga is Dung Beetle Square, where zoo guests will gather to watch wildlife, socialize, learn, enjoy, share experiences, take photos and make memories! It is an ideal venue for zoo guests to learn about various dimensions of the safari experience. Lions Pride is a naturalistic exhibit offering unique and intriguing ways to view the pride of lions at the Topeka Zoo. Floor-to-ceiling windows will allow visitors to see lions up close. Climb aboard this Safari Vehicle and be on the lookout for Red Patas Monkeys as they sit on the hood of your vehicle, and look at you through the wind shield! Camp Cowabunga guests can climb aboard a hot air balloon basket and learn why it is one of the best ways to see Africa. Graphics will be incorporated into the exhibit that will depict how a hot air balloon operates. At the heart of every safari camp is the campfire circle. At Camp Cowabunga, you can rest and watch the glow of burning embers from the previous night’s fire. "Bringing the Heart of Africa to the Heart of Topeka"
Join Gary K. Clarke, Director Emeritus, World Famous Topeka Zoo, on this virtual tour of Camp Cowabunga. Can you help us on our trail to making Camp Cowabunga a reality? Camp Cowabunga is unlike any other Africa exhibit in any zoo in the world. This camp will transport guests to Africa through its unique concept that lets guests participate in activities that take place on safaris or at camp while being surrounded by animals from the moment they get to the camp entrance. 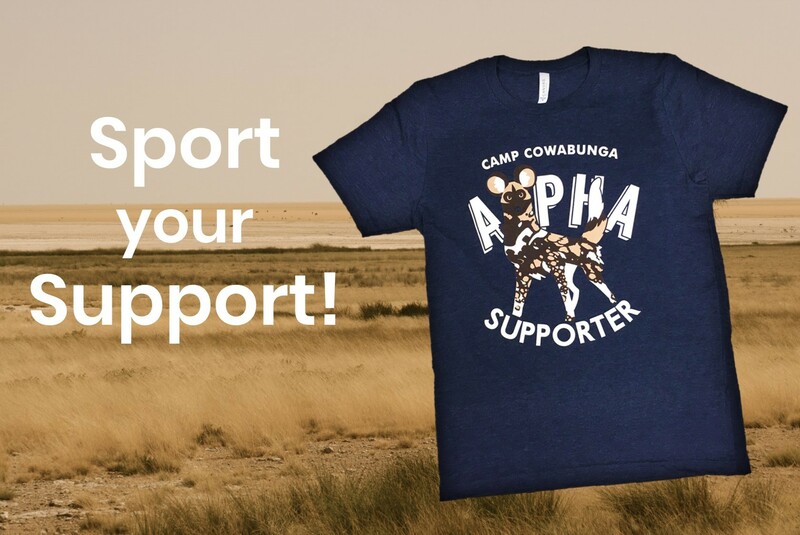 Do you want to join our pack and support Camp Cowabunga? We still have $480,000 to raise and need your help! 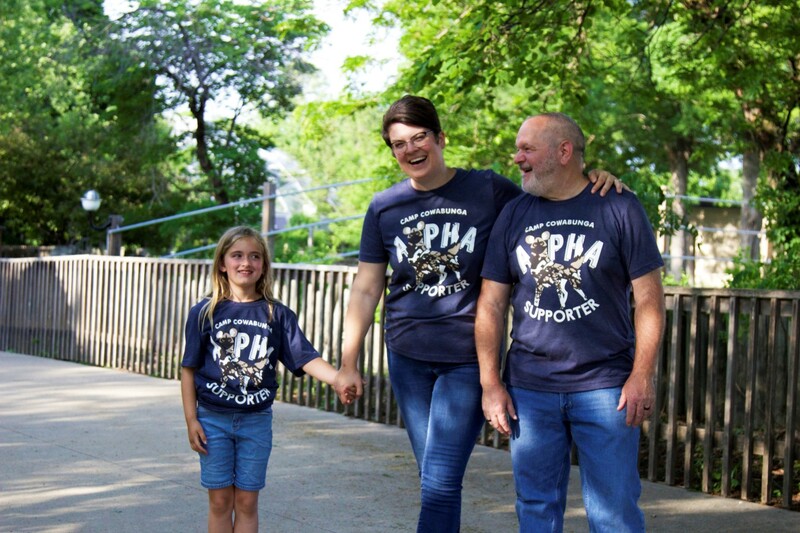 Through this unique campaign, a new donation of $100.00 or more provides you with a free Alpha Supporter shirt. Designed and printed here in Topeka by Reliant Apparel, you can sport your support in this comfy and stylish tee. With each shirt ordered, supporters will receive an entry into a sweepstakes to meet our Sun Bears, Ho Ho and Cupcake! These exclusive shirts will not be available outside of this offering, so join the pack today! You can make your donation in the Leopard Spot Gift Shop at the zoo or click here. There will be two waves of printings. Orders received by June 24th have an expected availability of July 9th. Orders received by July 22nd have an expected availability of August 7th. Only new donations provided through this campaign will receive the exclusive shirt and entry into the sweepstakes. Shipping is provided at an additional expense. We appreciate all the support from our community and can’t wait to share the Camp Cowabunga experience with everyone. Gary Clarke talks about Camp Cowabunga and gives you an interactive tour. Floor to ceiling windows will allow visitors to see lions up close. Guests will experience Devil’s Cataract at Victoria Falls. Climb aboard this Safari vehicle and be on the lookout for Red Patas Monkeys! At the heart of every safari camp is the campfire circle. See what Dung Beetle Square will look like in Camp Cowabunga.